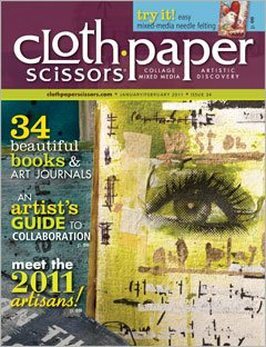 The January/February 2011 issue of Cloth Paper Scissors magazine features the work of finalists in the Mini Book Challenge run in the Fall of 2010. This issue includes both my starbook "A Sense of Place" and the side-bind book "A Walk in the Woods". Back issues are still available! Meet the incredibly colorful Adnan Charara. Experiment with polymer clay book covers. Learn how to mix papermaking with encaustics, and how to make fabric mail art. Create a folder Journal. Take a flip through our reader challenge "mini books." Jump into your own artist collaboration. Look at the In the Mix department for a look at book binding tools, new products, and our On Our Radar artist spotlight. Let us introduce you to the 2011 Artisans and finalists.